Lower Fort Garry was built in 1831 by Rupert's Land Governor George Simpson to avoid the periodic devastating floods that occurred at Upper Fort Garry. Known as the "Stone Fort," its walls were constructed of limestone 3 feet thick, about 7.5 feet high and encompassed over 4.5 acres. 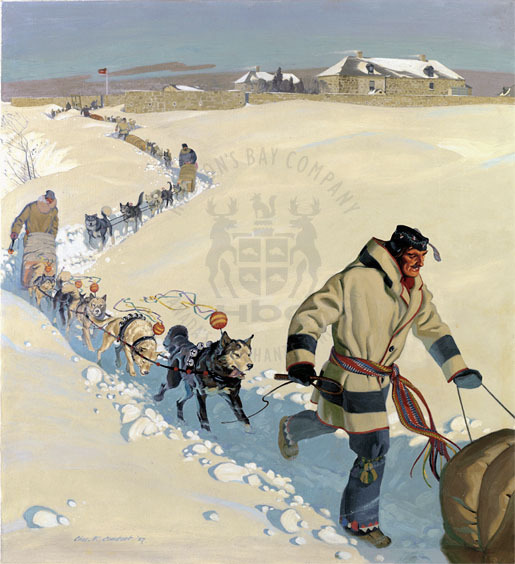 The main role of dog sleds was to carry goods, furs, meat, and messages to forts in the winter. Dogs were less expensive than horses, so every man could afford two or three to pull a sled. Drivers vied with one another in the smart appearance, speed, and stamina of their huskies. Dog trains usually comprised several sleds, travelling in file one after the other. By the early 20th c. other modes of transportation - primarily rail - were starting to penetrate areas previously accessible only by traditional means. In 1910 work began on a rail line from the Pas to Churchill, Manitoba. Visit Lower Fort Garry and take a virtual tour using an interactive map.